Kasco Marine, Inc. offers several sizes, models, and mounting options of De-Icers to accommodate almost every application and condition. Atlantic Pond Supply offers Free Shipping in Canada. With sizes of 1/2, 3/4, and 1hp and units available in 110/120V or optional 230/240V is available (contact us), Kasco De-Icers easily fit your location and electrical requirements. Kasco De-Icers can be suspended by ropes, mounted on an optional Universal Dock Mount, or attached to an optional Horizontal Float for operation in many conditions. Also, optional De-Icer Controllers (C-10 and C-20) can be added to the De-Icing system to help control electric bills. Free shipping in Canada. Taxes included in listed prices. De-Icing is accurately referred to as an art form more than an exact science. Each application and location is different and there is no set rule in determining how many De-Icers are needed for a given area or which mounting option is the best. The effectiveness of your Kasco De-Icer depends on many factors. Keep in mind the following table is to be used as a general guideline and each situation is different. Please contact us to assist in sizing and location if needed. * Small bodies of water, the Great Lakes, and extreme northern climates may see less open water areas. Kasco De-Icers come complete for suspended operation from a dock or boat in either a vertical or angled position. The angled operation by suspended method or with optional flotation unit produces an elongated pattern of agitated water. A vertical positioning produces a circular pattern. Vertical positioning of the De-Icer works well under boats and docks or between slips and boats. Adjusting the angle of the De-Icer suspension is done by simply looping one suspension rope back one or two ribs on the propeller cage. Angled operation can be used to de-ice shallow water areas. This will direct the flow warmer water from a deeper area into the shallower area. Remember, a De-Icer works because it draws warmer, denser water from the bottom and circulates it upward to the surface, preventing ice formation or melting existing ice. It is often easier to de-ice a boat by installing the de-icer at or near the bow, angled toward the stern. If the water flow is directed toward the shore or a retaining wall, it will flair, forming a desirable"T" shape de-icing pattern. In tidal waters, split the difference in water depth so the De-Icer is in shallow water at low tide and deep water at high tide. Or, tie your De-Icer to the boat and allow the boat and De-Icer to rise and fall with the tide. 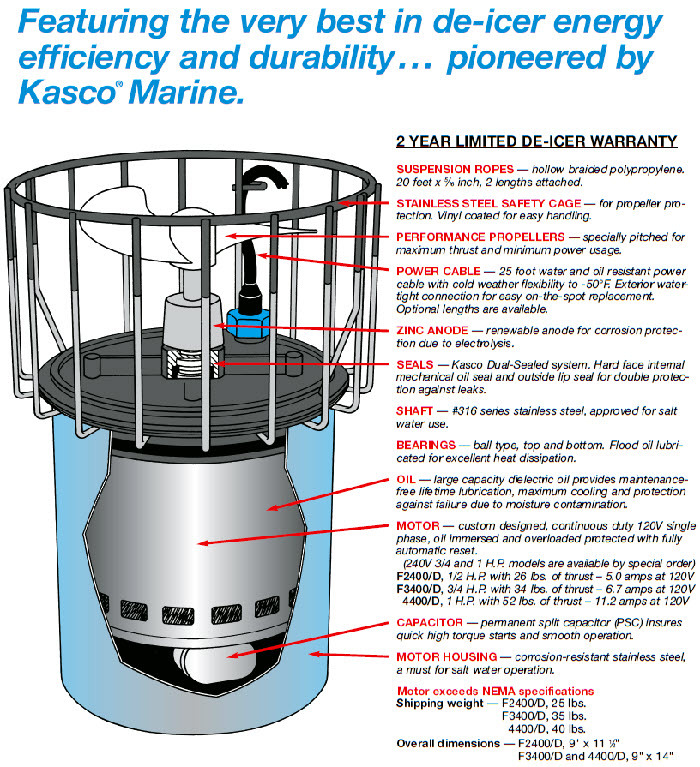 Kasco Marine, Inc. offers an optional Universal Dock Mount or Piling Mount that can be used with any Kasco De-Icer. This heavy-duty Universal Dock Mount or Piling Mount is made from thermal plastic composites, corrosion protected steel, and stainless steel to withstand the toughest marine conditions. The De-Icer is mounted to the "underwater parts" of the Universal Dock Mount and the "above water" parts are mounted to the dock or piling. Due to shipping limitations, a 1" pipe extension needs to be supplied by the purchaser to connect the "underwater parts" and "above water" parts. The new Easy Lock handle makes adjustments in the water a breeze. The De-Icer may be operated in a vertical or several different angled positions. The De-Icer may also be adjusted to a maximum depth of 10' from the above water mounting brackets and it may be moved 360 degrees. This allows for a variety of operating positions and is able to fit and adapt to many different situations and conditions. Kasco Marine, Inc. offers an exclusive, arctic proven flotation kit that is optional for all De-Icers. The easy-to-assemble kit consists of stainless steel components and a flotation block. The De-Icer unit is mounted horizontally to the surface of the water, just below the flotation block. The De-Icer can be angled in several positions; horizontal and above and below horizontal. The horizontal operation of the De-Icer produces an elongated pattern of agitatedwater. 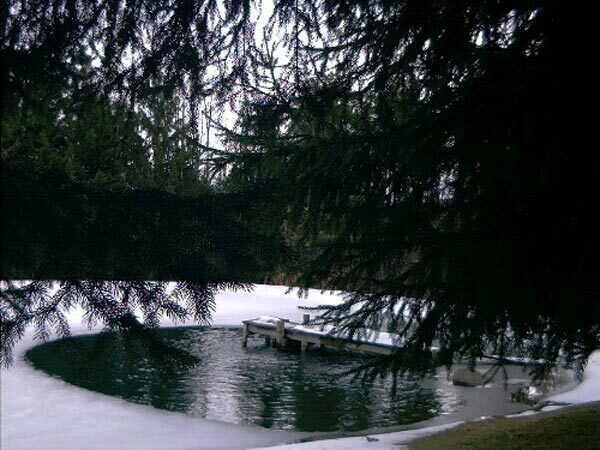 This is well suited for tough problems such as shallow water areas, areas where water and ice levels fluctuate such as tidalwaters, or where elongated open water areas are desired, such as around long docks. With adjustable angles above and below horizontal, the De-Icer can also be suited to fit many water depth and obstruction conditions. Superior dependability in salt-water or other corrosive environments. All external metal motor, float, and hardware components are of stainless steel composition and protected by a sacrificial zinc anode. Requires minimal maintenance. We recommend cleaning the stainless steel motor housing once or twice per year and replacing the sacrificial zinc anode when visibly corroded. Kasco Deicers Bubblers are probably the best known and the industry standard in preventing dock damage in Canada. Kasco deicers are designed to be used in the harsh Canadian climate and are used in Nova Scotia, New Brunswick, PEI and Newfoundland by private marnas, small vessel owners and dock owners who want to prevent ice damage. The submersible motor of the Kasco deicer, sometimes called a bubbler, keeps ice from damaging docks and boats. Kasco deicers will leave large areas of open water even in cold Canadian conditions and are also used to keep pump intakes and dam structures free from ice.